Suchitoto bound and they give a nostalgic sigh. And rightly so, as this little town 47km north of the capital is everything El Salvador once was before the civil war and various natural disasters. In a setting of whitewashed colonials and cobblestone streets, it's gossipy, leftist-leaning and beaming with civic pride. A cultural capital during the indigo trade's heyday, it now has a burgeoning arts scene. A February arts-and-culture festival brings in world-class performers and concerts, and performances or art exhibits are held almost weekly..
Suchitoto overlooks the Embalse Cerrón Grande, also known as Lago Suchitlán, a reservoir visitors can enjoy by boat. It is also a bird migration zone with over 200 species. Thousands of hawks and falcons fill the skies as the seasons change, and birds of all sorts nest in the relative safety of the islands.It is presumed that Yaquis and Pipils settled in the area some 1000 years ago. 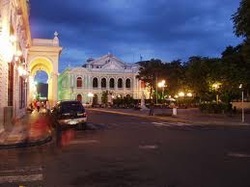 El Salvador's capital was established near here in the early 16th century. More recently, some of the earliest fighting of the civil war began in Suchitoto, accompanied by much destruction and emigration. Today the town has rebounded to become the highland seat of national tourism. Suchitoto is a municipality in the Cuscatlán department of El Salvador. 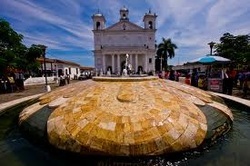 Area around the main square of the colonial town of Suchitoto, with its church built by the Spaniards in the 1700's. Suchitoto is widely known throughout El Salvador for its church and for its cobblestone roads. Suchitoto is one of the few areas in El Salvador where there are still cobblestone roads. It has an excellent view of Suchitlán lake, which is an artificial lake formed in the Lempa river and the Cerrón Grande dam. It is a very popular weekend destination for Salvadorans. It has broad cultural activities such as art galleries, cultural centers, and handcrafts.